Humans began cooking with clay pots over 20,000 years ago, and have no plans of stopping. Most clay cookware can't be used directly on a heat source, but this beautiful skillet, made by Morgan Baum of special "Flameware" clay, can handle what other clay can't. Cook on a gas or electric burner, move the skillet from stovetop to oven, and when the food is cooked to perfection, serve with it. Its simple, graceful lines and elegant gray glaze look beautiful on the table. Cleanup is easy, too. Only a few potteries make this kind of cookware. This one, in central Minnesota, also serves as an incubator for potters to learn how turn their passion into a successful business. Home chefs, slow foodies, and fans of handmade ceramics will swoon over these very special skillets. Handmade in Hutchinson, Minnesota. Note: allow the skillet to reach room temperature prior to using on the stove or oven. Small Skillet: 9" diameter x 2.25" H (13.75" L with handle); 2 lbs. Large Skillet: 11.25" diameter x 2.25" H (17.5" L with handle); 3.8 lbs. Cooking breakfast is amazing with this product! Very durable and easy to wash. Food doesn't stick as easily to skillet like other pans:). I feel good about using this since there are no harmful elements to it like Teflon etc.... it is very heavy and durable. I use it every day. 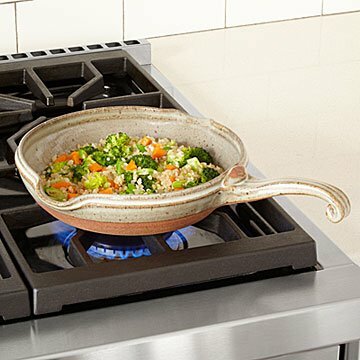 Have been looking for a safe skillet like this for a while and it is worth the price.